Not all event venues give you the option of moving the tables and chairs to perfectly accommodate the exact number of guests at your party, wedding reception, or corporate gathering, and the ones that do often force hosts to rearrange the furniture themselves. At Hollywood, we offer dozens of prefabricated floor plans specifically-designed to elevate events of all types and sizes! The right table settings can elevate the atmosphere of an event or, in the case of wedding receptions, serve to complement the bridal palette. Allow Hollywood Banquet Hall’s professional coordinators to provide the perfect flatware, silverware, centerpieces, napkins, and tablecloths for your next important social or business function. To guarantee we’ll have exactly what you want, Hollywood also partners with the area’s leading decorators and event planning specialists! Delicious cuisine is arguably the most important aspect of any event, and Hollywood Banquet Hall is committed to providing only the finest internationally-inspired food for your next birthday party, wedding reception, or corporate gathering. Depending on the type of event you’re planning, Hollywood offers a variety of service option, including Hors D-oeuvres service, family-style dining, buffet-style, and single-plate full service dining. In need of a great wedding or birthday cake? We also partner with some of the best confectioneries and bakeries in the area! Boasting a large dance floor and plenty of room for entertainment of all types, Hollywood is the perfect Los Angeles event venue for lively functions. Popular performers include DJs, live bands, lounge singers, dance troupes, and more! For those hosting a party that features dancing as party of the festivities, like a Quinceanera or Bar Mitzvah, Hollywood Banquet Hall provides plenty of space for the participants. 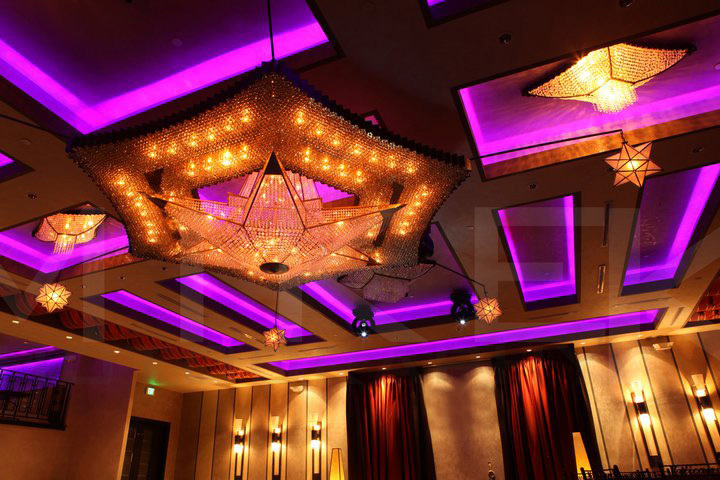 Featuring an impressive, state-of the-art LED lighting system, Hollywood can transform from event to event (or from hour to hour, within a single event) to match the mood or color palette of any celebration. What’s more, our gorgeous crystal chandelier adds an element of luxury to the ballroom’s already opulent atmosphere, lending an air of sophistication to company functions and making wedding dances unforgettable occasions!